This remnant deciduous treestand is located immediately north of the Lessard Community League building. 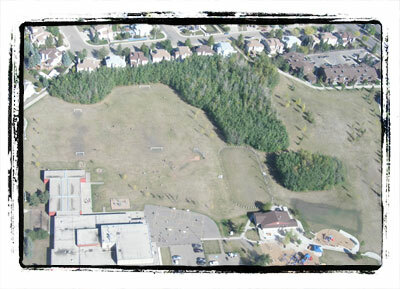 This site is a relatively small urban treestand situated amongst surrounding school sites, sports fields and other open space. The treestand is also relatively close to the river valley and ravine system with connections to the ravine area west of the stand and to the south along Lessard Dr. There are no formal trails through the interior of the stand; however, much of the natural area can be viewed from its perimeter. 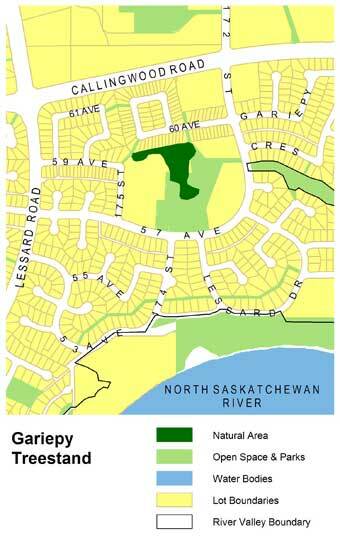 Gariepy Treestand is located in west Edmonton, west of 172 St. and north of 57 Ave. The treestand makes up the northern portion of Gariepy Park. It is accessible from the south, east and west sides from the rest of the park, and by a walkway to the north that connects the park with 60 Ave. Parking is available on 57 Ave. to the south and 175 St. to the west. Due to the relatively small size of this site, the treestand does not provide adequate space for critical habitat. However, a variety of bird and small mammal species can be found at this site.